I love the warm June sunshine – it has been a wonderful summer so far and I am thrilled that it is once again Strawberry Season. While I would love to be one of those talented gardeners that grow everything I need, my gardening skills are not that successful! Fortunately there is a lovely pick your own farm not to far from home and my friend D and I headed off there last Sunday. Its very companionable moving among the warm straw lines, spotting and picking the delicious red berries among the lush green leaves; the sun warming our backs as the gentle breeze plays with strands of our hair, the easy conversation mixing with birdsong as we catch up on our lives. I love the smell of hay as it rises warm from the sun reminding me of so many good times in strawberry fields: childhood days spent roaming the fields, my own children in competition to find the biggest sweetest ones their chins evidence of the fruit that did not make it to their baskets. There is nothing to beat the taste of a strawberry ripe and warmed by the sun. There are so many wonderful pleasures associated with this small simple act, gathering your own is almost as good as growing your own and the price of the strawberries makes it worthwhile too. Of course jam making is a slow process; one that fills my kitchen with the sweet delicious smell while they seep in the sugar. 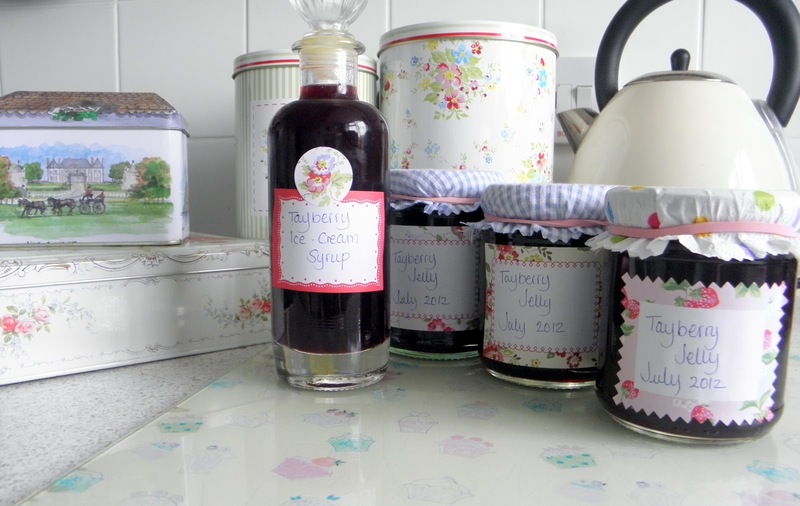 I tried a few new ideas this year as strawberry jam is notorious for not setting well – I was thrilled that I achieved the soft set I was hoping for. 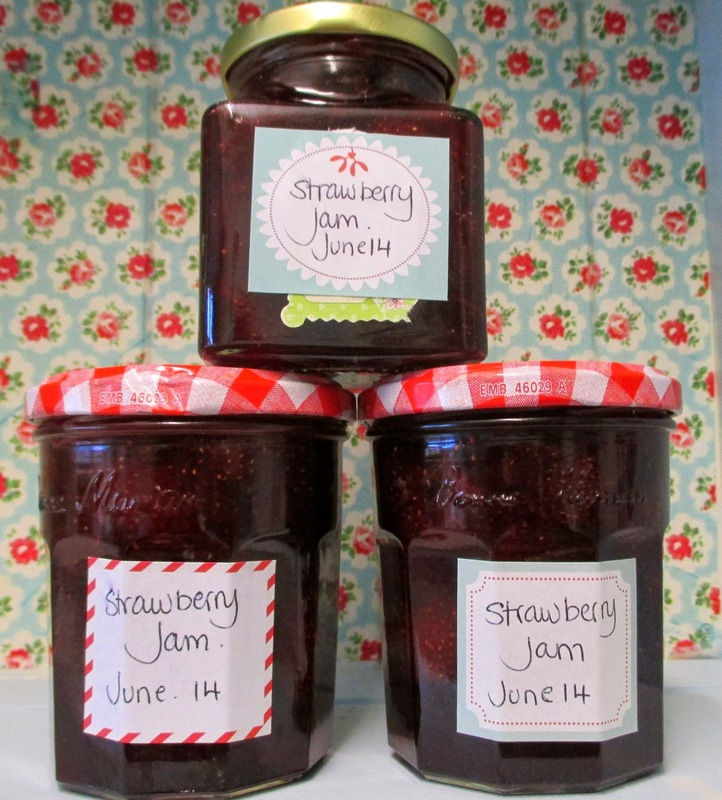 I have included the recipe here if you want to make some yourself, it is very satisfying to have the jam on the shelf only days after they are picked – it gives me a glorious sense of blissful domesticity. 900g / 2lb strawberries, hulled. Peel and then finely grate the apple – place the peel and core in the muslin square and knot tightly to encase the apple then add to the strawberries and sugar. Cook over a low heat stirring continuously until the sugar has dissolved, then allow to boil gently for around 5 minutes just enough for the fruit to soften. Turn off the heat and cover with a clean tea towel and allow to stand for another night. Before you begin cooking the jam -place two saucers in the freezer, you will need them to be very cold in order to check the jam for setting. Sterilise the jam jars by placing them into a warm oven (lowest setting). This will also mean that the jars won’t crack when you spoon the hot jam into them. Add the juice and grated rind of the two lemons to the strawberries and place the sugar thermometer on the side of the pan ensuring that it is not touching the bottom of the pan. Bring the jam back up to boiling point, stirring the fruit now and then – boil rapidly (the jam will do a rolling motion) for around 5 minutes. Check the thermometer – the temperature should reach about 220 or the ‘jam’ setting. To test for setting -take a small teaspoon of jam and place it on the plate, return to the freezer for a few moments; the jam should be slightly thick when you push your finger through it. If it remains runny then boil again for a few more minutes and then repeat the test until you are happy with the set. Place your butter into the jam and turn off the heat, stir the butter until all the bubbles are gone. Let your jam to cool a little (about 10 minutes) so that the fruit will be evenly distributed in the jar rather than sinking to the bottom. Ladle into the warm jars and cover with a wax disc. Run a damp cloth round the edge of the jar, this will discourage mould to form. Screw up tightly and allow to cool. Label and decorate with fabric and ribbon if you wish; enjoy the warm glow of being a domestic goddess! Delicious on a warm baked scone or fresh white crusty bread and butter! The fruit wasn’t as well signposted, and it was a little muddy underfoot, so we ended up next to the bayberry bushes and could not find raspberries anywhere. Tayberries are a cross between black berries and raspberries, but they have their own unique flavour. This took days to strain but well worth the effort, it does mean that you get a very good jam base that can be used as a basis for sorbets and puddings, mixed with apple works well, or simply little jam tarts! The syrup is good on ice cream, or combined with fizzy water for a nice long drink. The best thing about eating the jelly is the memory of spending the afternoon gathering the fruits together, it was the first bright day for a while and we picked them together. There is definitely something goddess like, to have these little pots sitting in the pantry.